Current weight loss procedures or bariatric surgery includes stomach stapling, stomach banding, gastric balloons and surgical bypass of the stomach. The common goal is to promote weight loss. As with any surgical procedure, it is essential to have interactions between the surgeons, patient, family members of the patient, and the counselors. It helps to know the risks involved and accept them before giving a go-ahead for the surgery. The most obvious benefit of bariatric surgery is rapid weight loss. One study has shown that blood sugar levels of most obese patients with diabetes returned to normal after surgery. Nearly all patients whose blood sugar levels did not return to normal were older or had diabetes for a long time. Breathing disorders such as asthma and sleep apnea generally improve. Improvements in cardiovascular conditions such as hypertension, high cholesterol, etc. can be seen. Stress incontinence also responds dramatically well to surgery. Weight-related aches and pains can be resolved through bariatric surgery. Some patients may regain weight after bariatric surgery. This may be due to noncompliance with postoperative diet, noncompliance with postoperative exercise, or stretching of the stomach pouch. The nutritional deficiencies include Vitamin deficiencies (A, B-12, D, E, and K) - Deficiencies of vitamin B-12, folate, and iron can cause anemia. Mineral deficiencies like calcium are also eminent, and may lead to osteoporosis and other bone disorders. Post-surgery symptoms may include pain and discomfort, nausea, vomiting, diarrhea, wound infections, etc. The other high risks can be abdominal hernias, bleeding ulcers, gall stones, etc. which might require special monitoring and re-surgeries depending upon the individual. A condition known as "dumping syndrome" can occur as a result of rapid emptying of stomach contents into the small intestine. This is sometimes triggered when too much sugar or large amounts of food is consumed and patients experience nausea, abdominal cramping, diarrhea and fainting after eating. 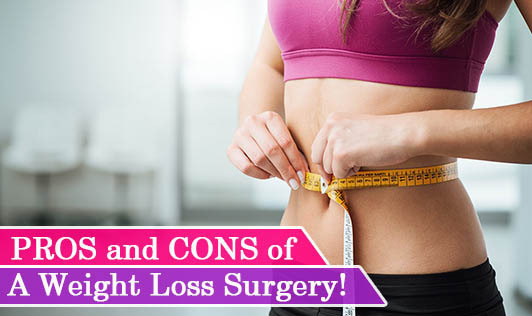 *Note- Weight loss surgery should be the beginning of a new and healthy lifestyle. To make the most of the surgery and to maximize results, people need to: eat healthy and take nutritional supplements after consulting the dietitian, break binge-eating habits, and exercise regularly.